Universal Compatibility. It is suitable for Windows 2000/ME/XP/Vista/Windows7, Linus and other systems. Support both laptop and desktop with USB 2.0/1.0 port. USB2.0 High Speed. It is compatible with USB2.0 and backwards compatible with USB1.0. 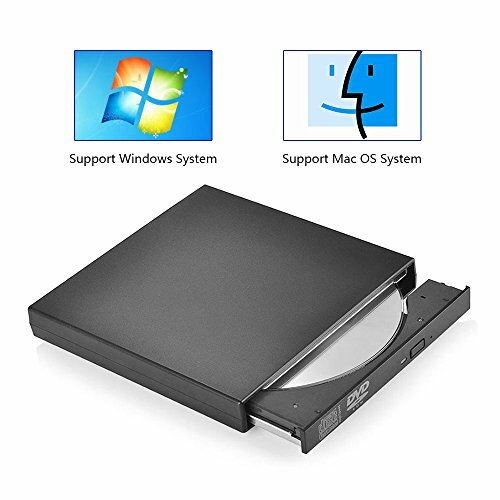 This CD combo drive supported DVD+R, DVD-R, CD-ROM, DVD-ROM, CD-R,. Max DVD read speed 8X; Max CD read speed 24X and max CD burn speed 8X. It will be specially handy for your work if you want to give presentations to the business. Just burn the CD to suffice everything and do not need to carry laptops everywhere. Accessories Including Two Cable. Come with 2 cables, one is data cable and the other is power cable that can supply power to get rid of the trouble of shortage power. When connect it to the desktop, please connect both cables or connect it with the computer's mortherboard. It is suitable for Windows 2000/ME/XP/Vista/Windows7,Linus and other systems. Support both laptop and desktop with USB 2.0/1.0 port. Internal laser light are harmful to the eyes,please don't look it directly. Please don't put this device near strong magnetic objects. Please don't put the device in an easy be extrude environment,so that to make sure the good functions of device. 【Universal Compatibility】：It is suitable for Windows 2000/ME/XP/Vista/Windows7, Linus and other systems. Support both laptop and desktop with USB 2.0/1.0 port. 【Practicability】：It will be specially handy for your work if you want to give presentations to the business. Just burn the CD to suffice everything and do not need to carry laptops everywhere. 【Accessories Including Two Cable】：Come with 2 cables, one is data cable and the other is power cable that can supply power to get rid of the trouble of shortage power. When connect it to the desktop, please connect both cables or connect it with the computer's mortherboard.